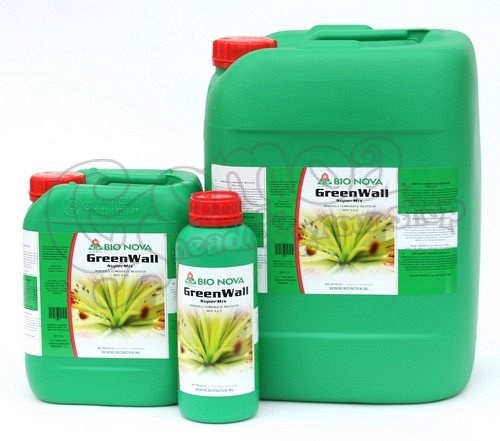 Bio Nova GreenWall is a complete fertiliser for plants in wall and roof systems mostly with rockwool or other artificial substrates. It contains all the necessary macro- and micro elements for healthy grow and abundant flowering. Contains 100% pure and natural active ingredients! Its usage comes with low EC-values, so that the plants can take up all the nutrients. If you want to make your plants grow more flowers, it is advised to use PK 13-14 additionally. In case you use soft water for irrigation, you can make up for the calcium with Bio Nova Ca fertiliser. Dosage: 15-32,5 ml fertiliser for 10 litres of water. In the first grow weeks low dosage is enough. With the advised additionals the results are guaranteed!